Influenced by disco, jazz, Latin and Afro, Pastaboys (DJs Uovo, Rame and Dino Angioletti) have remixed for the likes of Strictly Rhythm, NRK and MAW in the past. Their finely crafted, much anticipated debut album includes contributions from Soul II Soul vocalist Wunmi, Osunlade, Ohm Guru, Maestro Garofalo, Cristian Lisi, Banda Favela’s Roberto ‘Red’ Rossi and singer Jovin. – Osunlade, DJ/artist/producer spearhead of the spiritual/tribal House movement with his Yoruba label. 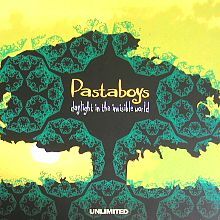 Together with Pastaboys they form Atelewo, included in this album with the track “Chimes of Freedom”, released as a single on Unlimited in 2003. – Shawn Cristopher, singer responsible for various House hits over the years. On the album she is featured in a re-recording of “On & On”, which originally appeared on “Tortellini EP”. – Wunmi, singer and dancer initially known for being Soul II Soul”s front woman on their legendary first album. Later became involved with Masters at Work and Bugz In The Attic, among many others. She wrote and sang three songs on the album: “Free Your Mind”, “Babalawo” and “Fallin”.